At 20.35 hrs. on the evening of 11 November 1940, the first of 21 Swordfish took off from H.M.S. Illustrious to fly 200 miles across the Mediterranean in the moonlight. Their target was the Italian battle fleet tucked ‘safely’ in their well defended harbour at Taranto, Italy. The planners had estimated a casualty rate of at least 50% for the 42 air crew. The TAGs had been left behind to make way for a 100 gallon oil drum full of the extra petrol needed for the long flight which ‘sat’ in the open cockpit next to the observer. At 22.56 hrs. the first of the two waves of aircraft began to attack. In the 10 minutes over the target they had sunk two battleships and left a third so badly crippled that the repairs were not finished until after the war. Three cruisers were severely damaged and a seaplane base and an oil refinery destroyed. Only two aircraft were lost; two crew were taken prisoner, but sadly, the other two were killed. The astounding success of this operation led to the Japanese repeating the same tactics a year later at Pearl Harbour. John Welham’s autobiography, ‘With Naval Wings’, was published in 1995. 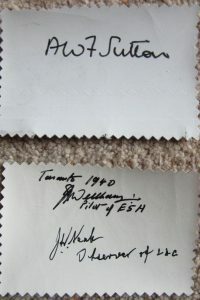 Alfie Sutton’s biography, ‘Seven Seas, Nine Lives’ was published in 2006. Begun in 2002, this project has so far raised over £30,000 to keep the Fairey Swordfish in the air. These swatches 0f Irish linen fabric were removed from the Fairey Swordfish operated by the Royal Navy Historic Fight (now Navy Wings) during restoration. Each historic swatch has been signed by distinguished wartime Swordfish veterans who were thrilled to be able to help keep their beloved ‘Stringbag’ flying just by signing their name. 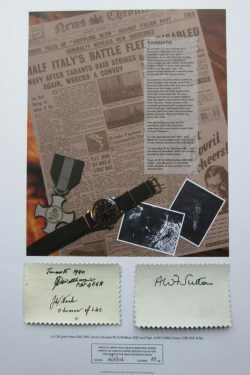 Each swatch comes with a print showing memorabilia, photos and newspaper cuttings pertaining to the action. 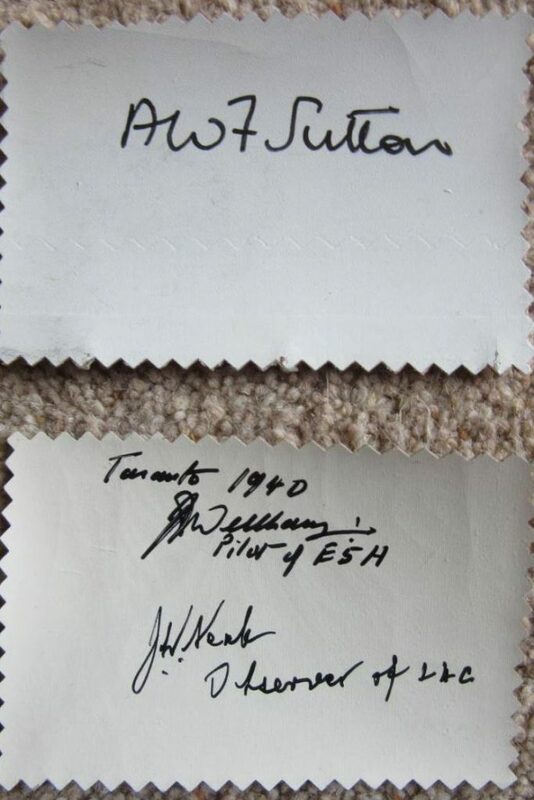 Each swatch is approximately 9 cm x 6 cm of Irish Linen fabric removed from the port aileron of Swordfish W5858. Each print/swatch will be sent in a cardboard tube. All money raised will go to Naval Wings (formally The Royal Navy Historic Flight) to help keep the Swordfish in the air where she belongs.